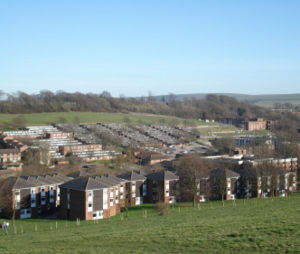 The University of Sussex is a British campus university which is situated next to the East Sussex village of Falmer, and is 4 miles (6.4 km) from Brighton. It is the only university in England to be located entirely within an Area of Outstanding Natural Beauty, that of the South Downs. The University of Sussex was the first of the new wave of British universities founded in the 1960s, receiving its Royal Charter in August 1961, and came to be identified not only with postwar social change, but a groundbreaking interdisciplinary approach, and later social engagement. The University is ranked within the top 30 in the UK, with The Guardian University Rankings of 2005 placing Sussex 16th, whilst the 2007 "Good University Guide" places Sussex in 27th position and the latest 2008 ranking sees Sussex move up to 24th. According to the 2008 Guardian University Rankings, Sussex has the number one ranked chemistry department among British universities, with its Professor Geoff Cloke recently being elected a Fellow of The Royal Society. The University of Sussex initially began as an idea for the construction of a university to serve Brighton. In December 1911 there was a public meeting at the Royal Pavilion in order to discover ways in which to fund the construction of a university. However, the project was halted by the First World War and the money raised was instead used for books for the Municipal Technical College. However, the idea was revived in the 1950s, and in June 1958, the government approved the corporation's scheme for a university at Brighton, the first of a new generation of red brick universities. The University was established as a company in 1959, with a Royal Charter being granted on 16 August 1961. Many of the universities founded in the 1960s take their name from the county in which they are located. The University of Sussex is unusual in that it is in the county of East Sussex and yet uses only the "Sussex" part of the name (alluding to the historic county of Sussex); there was no corresponding university in the county of West Sussex. The University of Sussex rapidly gained a reputation of radicalism and liberalism, which endures today, with the university's student union committed to political causes. Currently the University has a "no platform for fascists" stance, disallowing fascist parties such as the BNP the right to speak and debate at the University. In 2004, the University started using a new corporate-style logo in place of its coat of arms. Former vice-chancellor, Professor Alasdair Smith, said: "Our new visual identity is the starting point for what will be a fresh look and feel for Sussex. It is based on the university's vision and values, themselves a statement of what it aspires to be: pioneering, creative, international, excellent, engaging and challenging". The new logo is also meant to reflect the large changes that are occurring at Sussex, such as the opening of the new Brighton and Sussex Medical School, new degree programmes, and the largest amount of building work on campus since the university opened. The University retains the right to resume use of its coat of arms. There’s a unique flavour to Sussex that makes studying here a great experience. Our strong reputation for research attracts outstanding academic staff from around the world and provides firm foundations for our teaching excellence. Add to this our proud history for innovative learning approaches and inclusiveness, where everyone is encouraged to make the most of all their talents, and you have a recipe for outstanding success. In the sciences Sussex counts among its faculty two Nobel Prize winners, Sir John Cornforth and Professor Harry Kroto. Sir Harry, the first Briton to win the chemistry prize in over ten years, received the prize in 1996 for the discovery of a new class of carbon compounds known as the fullerenes. The University has 15 Fellows of the Royal Society - the highest number per science student of any British university other than Cambridge. In the arts, there are six members of faculty - an unusually high proportion - who have the distinction of being Fellows of the British Academy. Faculty publish around 3,000 papers, journal articles and books each year, as well as being involved in consultative work across the world. Sussex has counted two Nobel Prize winners, 13 Fellows of the Royal Society, six fellows of the British Academy and a winner of the prestigious Crafoord Prize in its faculty.